This is Capt. 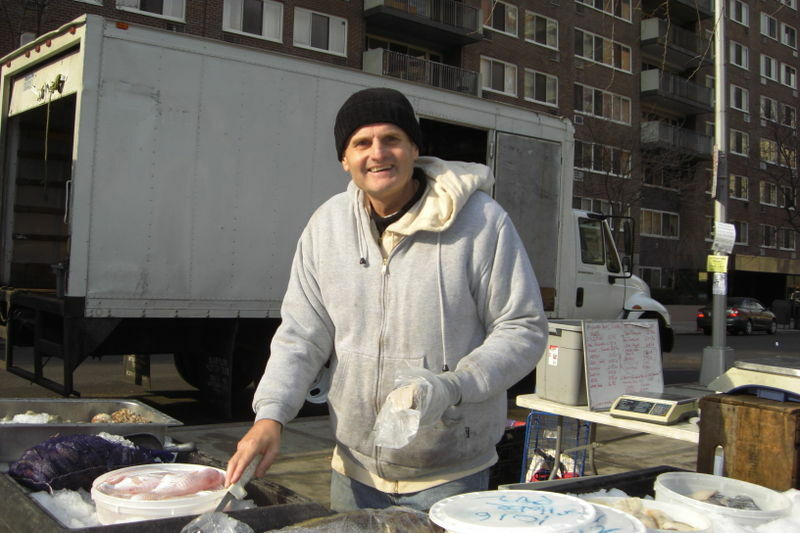 Rick, the fishmonger at my local greenmarket [97th and Columbus], where I go most Friday mornings. He sells great fish and shelfish, all caught in Long Island the day before. Last Friday, he told me that I should try the cat fish because it is in season. Cat fish? Only when he said, you know, bacalao, which i believe is the spanish version of baccala’. Ah, cod fish! Never cooked it before and don’t love it, but Capt. Rick is so charming, I bought it. He gave me his Norwegian recipe (he is originally from Norway): on a bed of potaotes and caramelized onions, with bechamel on top, in the oven at 400 degrees for 20min. Quick to say, but it took a while for me to understand. By the time I was comfortable I understood it, a little crowd had gathered. They all bought the cod fish! Last night, I made the first cod fish of my life and it was easy and, surprisingly, very good. Previous Post Do You See Any Difference?? Next Post Lesson of Knife – Or, was it Golf?